We’d love your help. 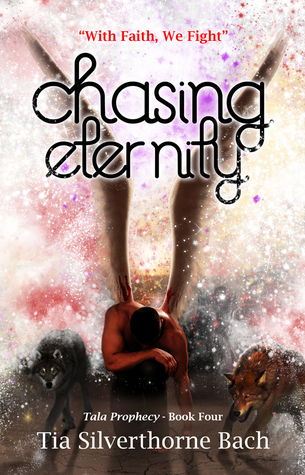 Let us know what’s wrong with this preview of Chasing Eternity by Tia Silverthorne Bach. To ask other readers questions about Chasing Eternity, please sign up. As I sit here to write my review less than 24 hours after binge reading Chasing Eternity, my emotions are still raw. I have loved this series since the beginning and now I have read the final book and my feelings are bittersweet. I am happy that I finally know how Reagan faired in her destiny , but sad that there will be no more stories with the characters that I have grown so attached to. This group of "heroes" that were thrown together to save the world from evil, have attached themselves to m As I sit here to write my review less than 24 hours after binge reading Chasing Eternity, my emotions are still raw. I have loved this series since the beginning and now I have read the final book and my feelings are bittersweet. I am happy that I finally know how Reagan faired in her destiny , but sad that there will be no more stories with the characters that I have grown so attached to. This group of "heroes" that were thrown together to save the world from evil, have attached themselves to my heart. I feel like I'm saying goodbye to an old friend. Thank goodness I can reread the series to visit them again. Chasing Eternity is everything a final book in a series should be. It has tragedy, hope, love, loss and the epic battle of good vs evil. I seriously cried so hard that I could barely continue to see the words on my kindle, but I couldn't put it down. At times my heart sank and I thought NO how can this be happening? Moments later I would feel like chanting their mantra "With faith, we fight." The intensity of the final battle did not let me down. I could visualize every detail as if I were in the forest fighting by their side. "The fate of the world is in our hands." Tia Silverthorne Bach has really pulled off the most amazing conclusion to this series. I may be heartbroken that it's over, but she hit it out of the park with Chasing Eternity. I highly recommend this series and urge you to have a box of tissues on hand. It's one heck of a ride. I leave you with a couple of my favorite quotes. "I'm chasing my eternity. But really, arent we all?" Wow what can I say about this book that I have not already said about the other books? Tia Silverthorne Bach never ceases to amaze me with the amount of twists and turns in the final book of the Tala Prophecy series. In Chasing Eternity you will find out who is really in alliance with Reagan, papa, and the pack. You will also find out who is devoted enough to fight with faith. Because the battle cry is "With Faith, We Fight". Who will survive the final battle between Rafe and Reagan? What part of the prophecy will come true? You ever read one of those series that has you racing to the end, but then, as the end approaches, you find yourself feeling sad? Lost? Desperately not wanting it to end because you just aren't ready to say good bye? This is one of those series. From the very beginning of Chasing Memories, I felt like Reagan was a friend- her character jumps off the page and you find yourself running along side her as her whole life turns upside down. From regular teenage girl to a hesitant savior, her transform You ever read one of those series that has you racing to the end, but then, as the end approaches, you find yourself feeling sad? Lost? Desperately not wanting it to end because you just aren't ready to say good bye? This is one of those series. From the very beginning of Chasing Memories, I felt like Reagan was a friend- her character jumps off the page and you find yourself running along side her as her whole life turns upside down. From regular teenage girl to a hesitant savior, her transformation is as engrossing as it is amazing. Wow, what a great read. The author's final installment of this series was awesome. I'd already loved most of the characters, but there were even new ones to love and hate in this book. The battle scene was awesome. Betrayl, surprises, and lots of action await you in this book. I have to warn you, have tissues near by, I teared up a few times. Definitely a must read and recommendation from me! I'm already having withdraws. The end of the series was perfect, full of tears, heartache, and love. What am I going to do.now without Tala? This book is amazing! So many questions answered. Be prepared for Tia's infamous plot twists that make your jaw drop, so much happens! ⭐⭐⭐⭐⭐ I'm already having withdraws. The end of the series was perfect, full of tears, heartache, and love. What am I going to do.now without Tala? I thought this was an AMAZING book. Once I got started with the book it was hard to put down. I thought this was a great way to end the saga. Regan is such a great main character and her relationship with Rowan. Plus this is saga is one of the few that I love the side characters just as much and one dies I get upset. I thought the ending was perfect, I loved it. Wow what a series! This is book 4 in the Tala Prophecy series. I adored each book in this series. When I was first asked if I wanted to read a book by Tia, I was hesitant. Ok, I will read the first book of this series was my response. Oh no! This series grabs you from the first book and doesn't let go until the end of the last book. Each book ends in a cliff hanger where you just MUST pic I was asked for an honest review free of persuasion from the author or anyone else affiliated with this book. This was a roller coaster of emotions! Good vs evil, twists, emotional highs and lows ( you will shed some tears), sacrifice, family, and so much more. And of course the pop culture references are strong just like in the previous books. Sad to see the series end yet loved how it did end. another great book in the Tala Prophecy series. It kept you engaged and on the edge of your seat. She is an award-winning, multi-genre au Tia Silverthorne Bach has been married to her college sweetheart for twenty years, has three beautiful girls, and adores living in sunny California. Her daughters were born in Chicago, San Diego, and Baltimore; and she feels fortunate to have called many places home. She believes in fairy tales and happy endings and is an avid reader and rabid grammar hound.